Shares of Apple (AAPL) have surged over 20% in the last six months to help the firm become the first publicly listed U.S. company to reach $1 trillion in market value. Now, amid some negative trade war speculation, Apple is set to announce its newest products later this week. So, let’s take a look at why Apple still looks like a must buy at this point. Right at the top, investors should note that some of President Donald Trump’s recent tariff proposals could negatively impact Apple, which might force the company to raise prices on some of its products in the U.S., according to Bank of America Merrill Lynch and Loup Ventures. With that said, Apple’s outlook is impressive and CEO Tim Cook is expected to introduce the firm’s latest iPhones and other products at Apple’s Steve Jobs Theater on Wednesday, September 12. The event will likely see Apple unveil the newest versions of Apple Watch, AirPods, and its updated iPhones, which will include its now-standard off-year "S" updates. At a time when the high price of Apple’s iPhone X helped lift quarterly iPhone revenues by 20%, it is worth noting that the company has boosted its offerings outside of its flagship smartphone. One of Apple’s most talked about growth units is the firm’s Services business, which includes AppleCare, Apple Music, Apple Pay, and other non-hardware offerings. Services revenues surged 31% last quarter, as Apple Music competes directly against Spotify (SPOT) and Apple Pay continues to perform well alongside Square (SQ) and PayPal (PYPL). Meanwhile, Apple’s “Other Products” business also soared 37%, making it Apple’s fastest growing unit for the fifth quarter in a row. Apple’s less-talked-about growth segment includes sales from AirPods, Apple TV, Apple Watch, Beats products, and HomePod. Apple has seen its stock price climb over 226% during the last five years, which crushes the S&P 500’s 74% and its industry’s 81% growth. Shares of Apple have continued to perform well over the last 52 weeks, with AAPL stock up roughly 35%. Investors should note that Apple stock is still up roughly 4% over the last month despite some of the recent trade war concerns. Moving on, AAPL stock is currently trading at 16.8X forward 12-month Zacks Consensus EPS estimates, which represents a discount compared to the S&P’s 17.3X. Apple is trading at a slight premium compared to its industry’s 15.4X, but AAPL has traded as high as 17.6X over the last year. Investors will see that Apple is currently trading very close to its five-year high. 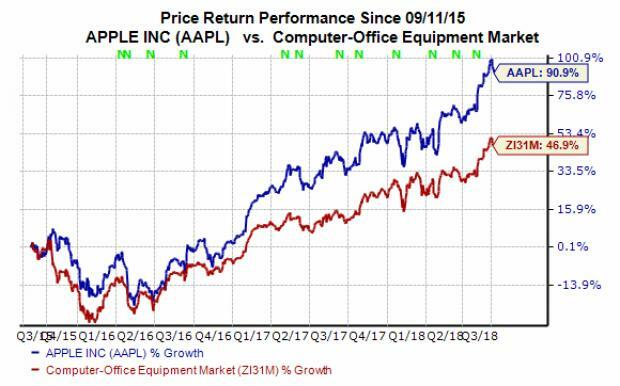 But, based on its impressive stock price movement and growth outlook, Apple’s valuation picture does not appear that stretched at the moment. Apple’s fiscal fourth-quarter revenues are projected to climb by nearly 16% to hit $60.98 billion, based on our current Zacks Consensus Estimate. Meanwhile, the company’s full-year revenues are expected to expand by roughly 15% to a mind-blowing $263.68 billion. At the other end of the income statement, Apple is expected to see its adjusted Q4 earnings surge by roughly 32.9% to hit $2.75 per share. For fiscal 2018, Apple’s earnings are projected to climb by 27.5% to hit $11.74 per share. Apple has earned nine earnings estimate revisions for Q4 over the last 60 days, with 100% agreement to the upside. The company has also received 10 full-year and 10 fiscal 2019 upward earnings revisions during this same stretch, against zero downward changes. This positive movement helps Apple earn its Zacks Rank #1 (Strong Buy). With all that said, Apple looks poised to continue to grow as it expands into new areas, which also includes a streaming TV service that will see the iPhone giant try to take on Netflix (NFLX), Amazon (AMZN), Hulu, and Disney (DIS).